One of the major advancements that has raised the bar for EMI inspection capabilities focuses around solid state hall sensors. 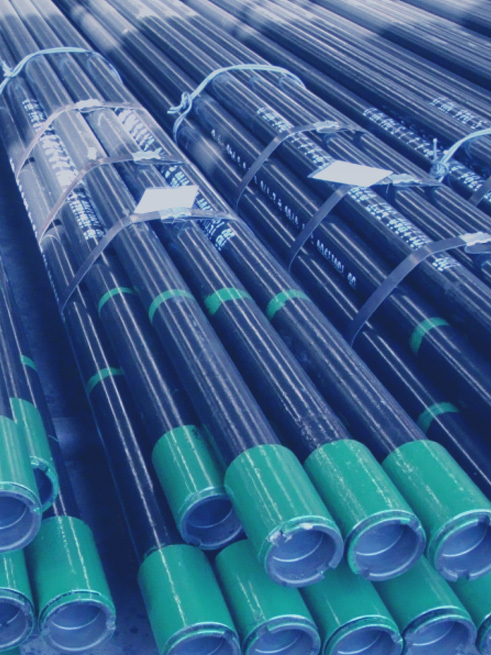 When inspecting OCTG tubing and casing, it is a common practice to utilize magnetic flux leakage inspection techniques. The primary objective is to fill the entire pipe body with enough magnetic flux, that any flaws on the ID or OD pipe surface will cause a disturbance in the magnetic field that can then be detected by sensors and reported through software to the quality personnel for further investigation. The magnetic field moves from north to south poles through the tubing or casing. When the magnetic field encounters a break of some kind in the material under inspection, i.e. an imperfection in the ID or OD surface of the pipe, the magnetic field will jump from one side of the imperfection to the other, in order to return to back to the ferrous material on the other side and continue its journey to the opposite pole. This jump, referred to as a perturbation, is the magnetic flux leakage that ultimately escapes and what will need to be picked up by the sensors, and reported to the operator, notifying them that further investigation is needed on that joint of pipe. Over the years, Scan Systems has helped further technological advances in the NDT inspection industry by continually updating and innovating their products and equipment, specifically our PITCO inspection equipment, to help achieve more efficient and accurate solutions. Through these advances in the industry, different variations of sensors were created to detect and report on the flux leakage created by the imperfection in the pipe. To achieve the best results with his type of sensor, the angle of intercept of the potential flaw and the sensing coil must be at a 90º angle. Meaning if the flaw or imperfection itself is off the axis being inspected by more than a few degrees, many EMI inspection systems will never detect that flaw. Wound coils are speed sensitive. The size and amplitude of signals detected are surprisingly dependent upon the speed the flaw intersects the sensor coil. This makes repeatability tolerances difficult to narrow as the same flaw can exhibit totally different characteristics with only a small variance in linear speed. This technology has a greatly diminished value in slower production lines. In the early 80’s, the NDT (Non-Destructive Testing) industry explored several alternatives to the PC coil. Magnetic Diodes, Emats, and hall elements being the primary subjects of study. All of which proved to have substantial drawbacks when used in daily operation. But advancements were made, and in the mid 1990’s there were some major changes, to hall element sensor designs in particular. The greatest drawback to the early hall sensors was their heat sensitive nature. If they got too hot, they gave erroneous data, or simply failed. The hall sensors have a 360-degree sensing area, as opposed to the 90-degree sensing area of the PC coils. This allows imperfections disturbing the magnetic flux to not have to be at 90º to achieve acceptable results. Now flaws can lay as much as 30º of the inspection axis and still be reliable identified. Hall sensors are not speed sensitive and thus allow for significant variations in the production line speeds. Without speed affecting the frequencies and amplitudes of the signals repeatability is now greatly enhanced and more reliable. Hall sensors have unique signature. The frequency and amplitude of the signal that is picked up by the sensor, is a unique signature that allows us to employ software algorithms that now can be easily identify and separate the signal for further processing and reporting. This has lead Scan Systems Corporation to greatly reduce many of the limitation of EMI inspection that we have been battling for decades. The evolution of the sensors is a testament to the fact that standard technologies in any industry, specifically the EMI inspection industry, should be challenged and evaluated all with the goal of seeking more efficient and more accurate technologies. Scan Systems’ PITCO Division has improved and evolved their equipment over the years to better serve the OCTG industry’s inspection needs. Through these enhancements, Scan Systems is paving the way for more advanced equipment providing for a safer industry.